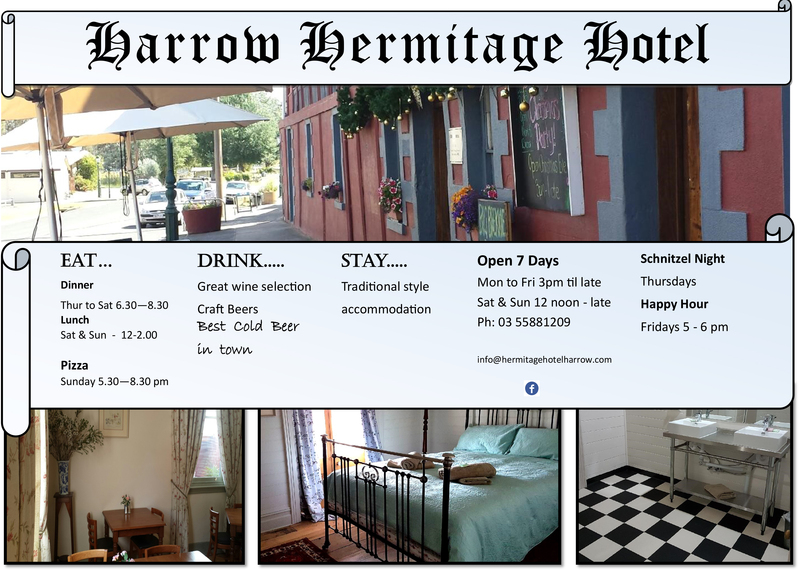 Welcome to the historic Harrow Hermitage Hotel. Built in 1848 and licensed in 1853, the Hermitage Hotel is the heart of what is believed to be the oldest inland settlement in Victoria. Set on the banks of the Glenelg River, our beautiful, historic building, offers a step back in time with all of the modern experiences you would expect from a quality hotel. Open 7 days, the Hermitage offers a range of beverage, dining and accommodation services to cater to a broad clientele. Keeping up with modern times, the hotel also offers a FREE wi-fi service to its patrons. Over the past four years, the hotel has undergone extensive restoration works and that will continue over the next 12 months, to ensure the Hermitage remains a feature of our beautiful little town. The Hermitage is also proud to be part of a small, but active community, regularly hosting and participating in a range of events from the renowned Harrow Bush Billycarts and Johnny Mullagh Memorial Cricket Match weekend, to seniors days out and the Harrow Sound and Light Show. For information about the Hermitage’s facilities and services, phone us on 03 5588 1209 or email info@hermitagehotelharrow.com. For accommodation bookings please phone the hotel on 03 5588 1209 from 3.00 pm weekdays to speak with a staff member to help you with your booking. We look forward to hosting you on your next visit to our beautiful region.